Most people don’t know about modern-day slavery, or if they do they only hear about it in a passing reference somewhere. They think it’s a rare problem, and they imagine perhaps it only happens in Thailand or with mail-order-brides. But it happens everywhere. The single most important thing we can do to end slavery is to spread the word: slavery is real and with us today. We need to talk about it, because if we don’t all know about it, and we don’t try to stop it, it will continue to live in the recesses and shadows of the world, forever. If you have a weblog, let your readers know about slavery. Let them know about the victims, and about what we can do to free them. If you want to write a post, you can use our sample post in its entirety or as a starting point. You might also want to start one of our memes. They’re good people, and they need to know what slavery is so that they can watch for signs of it in their communities and volunteer to help the organizations that work to end slavery today. Your community paper is often looking for good articles, letters, or general submissions from community members. With hundreds or even thousands of readers, these papers can be a great way to spread the word about slavery. Put up some flyers. Is there a bulletin board at your office, grocery store, or any meeting places you frequent? Is there one at your church or synagogue that would be appropriate? Take the opportunity to spread the word. One easy way to spread the word: the Polaris Project has some flyers and advice on ways to raise awareness of the national trafficking hotline, which is the place to call when you think someone might be being held as a slave. It might be a PTA, a homeowner’s association, a charity club, a hobbiest group–is there any group you belong to that has regular meetings? Slavery may not be the kind of thing that normally goes on the agenda, but that makes it all the more important to speak of: we need to speak of it where it’s not being spoken of, we need to–respectfully–find a little time, even just a few minutes, to explain that slavery is real and very much alive. Feel free to use our talking points for a place to start. Make sure slavery is on the curriculum at your community’s school. Is slavery on the curriculum at your community’s school? At your children’s school? Our history classes tell us that slavery ended in the civil war, but they and our health classes should be telling us that slavery is very much alive today, even though it’s no longer legal. If we are to end slavery, we need education. 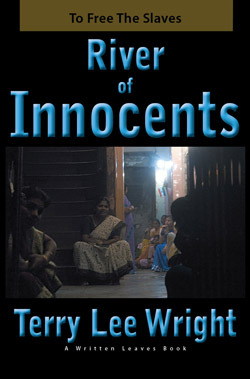 Tell people about River of Innocents. One hundred fifty years ago, Uncle Tom’s Cabin worked to free the slaves. Perhaps today, with your help, it can work again: River of Innocents is an Uncle Tom’s Cabin for today’s world. If you have an account with facebook, del.icio.us, digg, or one of the social networking sites at the bottom of our front page, click on the icon there to share River with your friends. Work slavery into your conversation. When people ask what you’ve been up to, tell them you’ve been learning about slavery. When prostitution comes into the public spotlight, whether because of infidelity on the part of our government officials as with New York State governer Spitzer, or because of Oscar-winning songs like “It’s Hard Out There To Be A Pimp,” use the opportunity to talk about slavery. Don’t harangue people about it–you want them to listen and respect your words, because there are lives at stake–but talk to them. It’s hard, sometimes, to bring up slavery in a normal conversation–it simply doesn’t fit, because it’s powerful and real and terrible. So use these opportunities to make it easier. It’s absolutely ridiculous, on the face of it, to think that hosting a party can help to end slavery. It’s true that it doesn’t open a cage door, break chains, or free even one person–not directly, and not if it’s all you do. But it spreads the word. It’s a start: get people together, your friends or your community or your compatriots in general–and have a party. And while you’re there, take time to talk about slavery. Depending on your time, resources, and the party size, this can be a talk of a few minutes, an ongoing game of fact-finding with clues planted throughout the party, or anything you can come up with. Search youtube and other internet movie sites for short documentaries on the subject that might be appropriate. Just do your best to be sure that people walk away knowing that slavery is real, and knowing they can do something about it.